Cross-brace, silver vein powder-coated steel frame. Padded and upholstered armrests are standard. Includes tool-free adjustable front riggings with composite footplates (Swing-away footrests or elevating legrests). Elevating padded legrests are equipped with a pneumatic piston for infinite elevating positions. Composite handrims with 24" solid rubber tires. 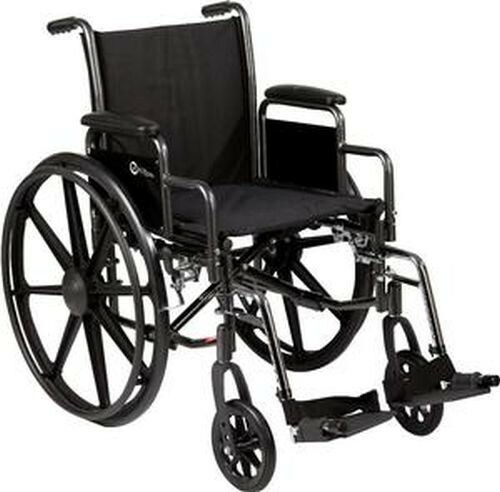 8" x 1" solid rubber front casters are adjustable in 3 positions. Easy push-to lock wheel locks. 5-year warranty on frame and cross braces, 90 days on all other parts.